The kidneys work with hormones in the body to retain or excrete fluids. These organs also maintain electrolyte levels, produce urine and filter waste from the blood. When function declines because of chronic kidney disease or kidney failure, the kidneys cannot perform these normal functions. This leads to changes in the skin and other parts of the body. Dr. Thomas Taylor, a Tampa, Fla., dermatologist, says that kidney disorders can lead to chronic dehydration. Dehydration occurs when the body loses more fluid than it takes in. This chronic dehydration leads to dry skin. Kidney disease also inhibits the oil-producing glands of the skin. Without the proper amount of oil, the skin becomes dry. 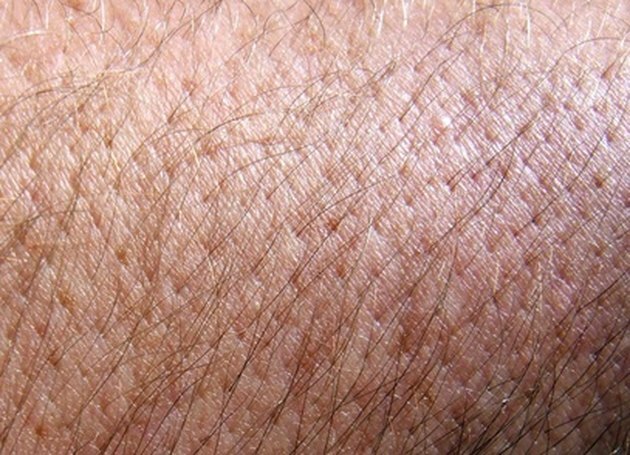 Dry skin caused by kidney disorders causes itching, discomfort and, sometimes, flaking. As kidney disease progresses, a build-up of waste in the blood makes the itching worse. Those with kidney disease should avoid hot baths and use hypoallergenic soap. Thoroughly drying with a thick bath towel is recommended. DaVita, a chain of kidney dialysis centers, recommends applying a thick moisturizer immediately after bathing. Because alcohol dries the skin, avoid beauty products that list alcohol as an ingredient. Proper care of the skin helps to prevent some of the complications associated with dehydration. Other than staying hydrated and using moisturizers, there is no specific treatment for dry skin caused by kidney failure. Doctors sometimes prescribe antihistamines such as diphenhydramine, chlorpheniramine, dimenhydrinate and doxylamine to relieve the itching. Because a build-up of phosphorus in the blood can worsen itching, some doctors prescribe phosphate binders. These drugs bind to phosphate molecules and remove them from the body. The National Kidney and Urologic Diseases Information Clearinghouse says that ultraviolet light can also relieve itching. Because damaged kidneys cannot filter the blood effectively, consult your doctor before taking any oral medication for itching. Some medications contain ingredients that could further impair kidney function. This would worsen the dry skin and other symptoms of kidney disease. What Are the Causes of Low Carbon Dioxide in the Blood? What Other Systems Affect the Urinary System?